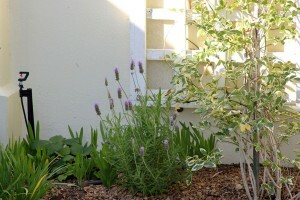 I had Lavender dentata planted in the narrow beds poolside about ten months ago. From the start the plants had a strange shape and as they grew, they sort of flopped around and never flowered. Two of the plants succumbed to mildew and I replaced them with new lavender plants, bought from the local nursery. Also sold as Lavender dentata, these were different from the start. They grew differently and have not stopped flowering from day one. The growth habit is upright and straight and they’ve responded beautifully to deadheading, rewarding me with constant flowering. And the shape of the plants is more what I expected when I first decided I wanted Lavender in the garden. 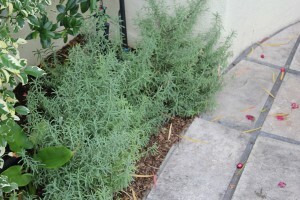 The “old” lavender bushes looked untidy and messy, were very “woody” and hard and have not flowered at all in ten months. As they are the first thing I see every morning from my kitchen window they really annoyed me on a daily basis and no amount of care seemed to be working. So now, after finding someone to take the old bushes, the deed is finally done … out with the old, in with the new. Its the third time I’ve replanted this bed in four years – lets hope third time’s the charm! 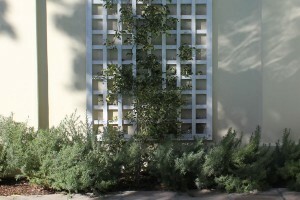 What I haven’t shown in the photo is that there are three sections to this bed – three trellises with Bower vines (Pandorea jasminoides “Charisma”) growing on them (also ten months old) and in total there are 12 Lavender plants with Mandevilla’s planted at the columns (in between the trellises). The last two photos showing the closer views of the lavender bushes shows the old lavender at about 8 months and the newer one after three months of growing in the garden (it was a really tiny plant when I first planted it). I love lavender! I am wanting to experiment in cooking with lavender. I do need to get a stand of lavender established; I’ve grown it twice before and it died. I’m trying a new site and we’ll see what happens. Have a wonderful weekend! It looks like lavender does all right in the shade? I’d love to grow some myself but don’t have a lot of ground space, except for in shady parts of the yard. I bet it smells great! Good luck with the new plants. A perfect change. The new lavender looks like it is the correct one for that area. More straight up and neater! Some types of lavender is just not always suitable! 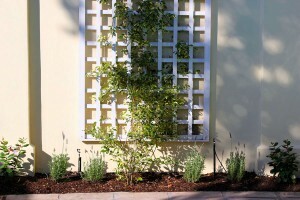 I know that lavender does not like to have wet feet all the time, so watch out with your irrigation system. I know my lavender is prone to mildew in winter. Enjoy your lavender!! Ok, I will watch it – truth is I’m hardly using the irrigation system at the moment preferring to hand (hose) water manually – but that may change come summer. Old lavender can get quite crusty. And you want to kick yourself for not doing it sooner. Thanks for reminding me. You are so right! I had to say good-bye eventually to an overgrown and woody “forest” of lavender recently and I have create a beautiful grass feature in its place. Never looked back! Hi Patrick – thank’s for the visit and thereby helping me to find your blog! I enjoyed the article “Science of pinching plants”. My garden is so young and new and in my eagerness to have this fill in and grow I’m often hesitant to pinch too much – but have seen great results when I do. Your article had me head outside to “pinch” this afternoon . I think I have had the variety you just got rid of. I couldn’t understand how other people’s lavender was so different. It looks like have the kind you have now and it even smells better. I love the Lavender. They look beautiful, are evergreen here which I love and the smell is fantastic. Yours looks lovely but will continue growing like the others unless you keep them trimmed well. Your area there is really lovely and I love how you are surrounding the trellis with them, that will look beautiful when grown in. Thanks Cher! 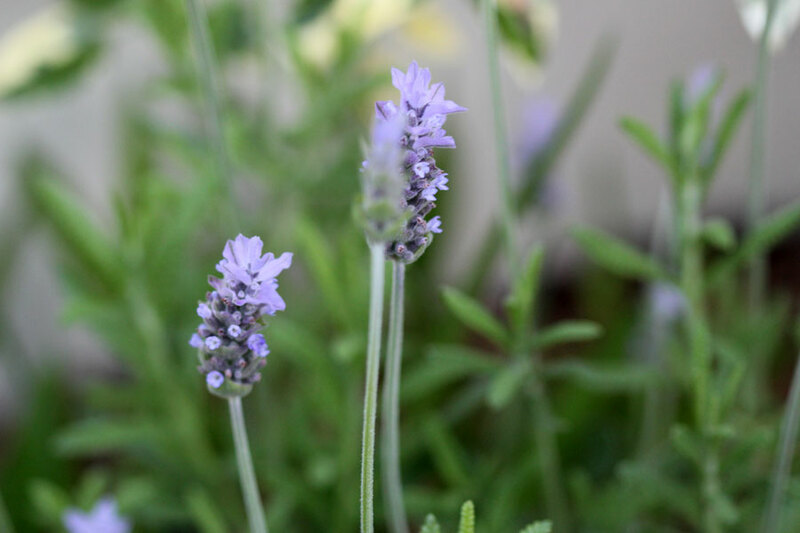 I’m reading up lots about how to care for the lavender better this time. I thought that it was my fault that the last ones went strange, but I’ve looked at the photos of them when they were newly planted and … they looked weird even then. Same shape, just smaller. This is a totally different looking one I have now. 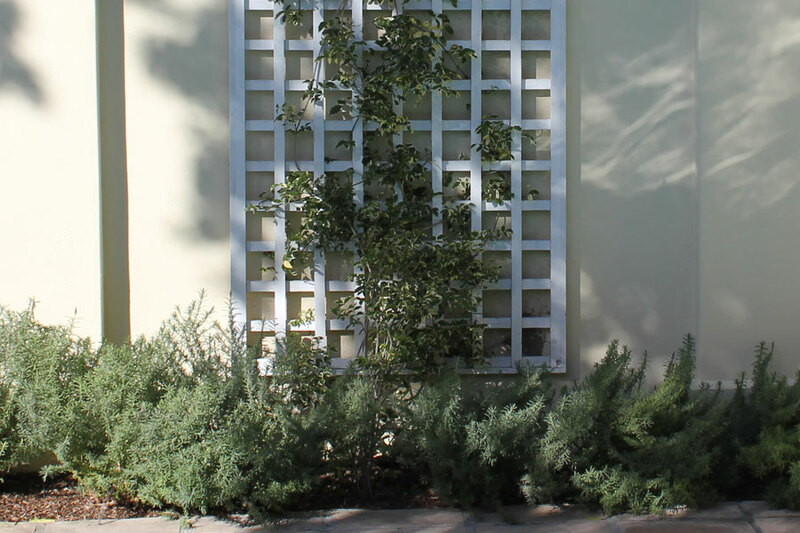 The last ones looked like someone sat on them – and the branches grew at 90 degree angles from the plant centre. But I will be very careful with these and keep them tidy and loved. I wonder if your problem with the ‘old’ lavender was that it did become woody. They don’t regenerate from old wood – hence the usual advice to clip lightly after flowering. You could have been left with a lot of non flowering growth. I envy you the Pandorea jasminoides. I’ve grown it here in Plymouth but it does need protection in winter. They really are lovely vines. Glad you’ve found a suitable replacement for the ‘old’ lavender! The new looks lovely. What a beautiful view to see first thing every morning.